Danny’s passion is ensuring that organisations have the right people in the right place to maximise business results. Danny was Director of Global Talent at Panasonic Corporation from 2008-2013 and was instrumental in the development and implementation of Panasonic’s Talent Management’s policies and procedures. The former Global Director of Talent at Panasonic will provide an insightful overview of your talent strategy. global talent management. In addition Danny will offer executive coaching. High Potentials on a global basis, their assessments against the leadership competencies and recommending their next career steps. The first non Japanese HR Director, Danny joined Panasonic in 1992 and took on a number of Pan European roles. Wide ranging in his responsibilities, Danny's main interest and passion was in the identification and development of the future leaders within the European Region. I have written a new book with Steve Frost on inclusive talent management. The main theme is around Diversity and Inclusion and how all talent decisions should be made with a D&I mind-set. The book was published by Kogan Page in July 2016. The book 'Inclusive Talent Management' has been short-listed for the CMI sponsored management book of the year award in the category Practical Manager. 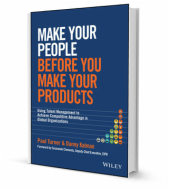 My first book (written together with my co-author Paul Turner) on Global Talent Management, titled Make Your People Before You Make Your Products, was published in November 2014 and is available online in hardback and can be downloaded as well as being available from major book stores. Danny is now an accredited coach with ICF (International Coach Federation) and is in the process of taking on a number of coaching assignments. If you would like to find out more about my services, experience or ask any questions, please fill in the form below.